A soldier turned advisor to the sultan, Jabir Nagi has always been obsessed with magic. A street rat with a burning hatred for nobles and those in power, Aali Zaman is obsessed with his anger. When a lamp with a trapped genie is found, will wishes come true or only nightmares? 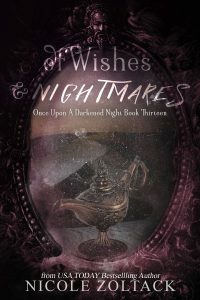 Of Wishes and Nightmares includes the short stories The Cost of Cynicism and The Cost of Dreams.